2014 appears to be ending with an economic bang. The news is good on several fronts. First and foremost, the U.S. economy grew at a 5 percent annualized rate in the third quarter. This marks the highest growth rate since 2003. Much of the growth can be attributed to consumer spending, which increased at a 3.2 percent rate. Employment is also performing quite well. 2014 will close with the biggest increase in national employment since 1999. 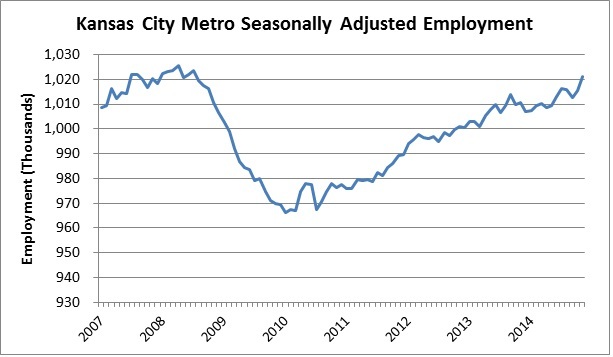 We have discussed before how employment growth here in Kansas City has lagged the nation since the recession, but local employment has continued to grow steadily. If this trend continues, we could reach our pre-recession employment peak early in 2015. And finally, something we have all noticed every time we stop to fuel up: gas prices have plummeted over the past few months. According to the U.S. Energy Information Administration, the average household spends around $2,900 on gasoline each year. This calculation was done before the recent price drop. As recently as June, gas averaged about $3.58 per gallon in Kansas City. If current prices hold, we will all be able to pocket hundreds of dollars would have gone in our gas tanks. And this price drop doesn’t look to be temporary. We are the beneficiary of some geo-political fighting around oil production and we, the consumers, could benefit from lower prices for quite some time. Here’s to a happy, productive new year!